LTHForum.com - Can't-Miss Restaurants Along the Old Route 66? Can't-Miss Restaurants Along the Old Route 66? LTH Home > Chat > Beyond Chicagoland > Can't-Miss Restaurants Along the Old Route 66? We are debating taking a trip along bits and pieces of the old route 66 this fall, most likely doing the stretch in New Mexico, Arizona, and California. What restaurants should I be trying on or near this historic road? Tacky and cheesy places are preferred, of course. I know that much of the road is gone, but would like to follow as much of it as possible. I have gone from Illinois to Arizona following Route 66. There are several fine guidebooks that detail the food to seek out along the way. We rarely diverted from their advice largely to support what was left. This was the life before I took pictures of my food, so I don't have much to offer concretely. If the poured concrete teepee motel still exists around the Painted Dessert, then make every effort to stay there. When we visited the children of the founders were running the place. We noted lots of European tourists documenting the place, which still had the log furniture built by their Dad. The kids are fundamentalist Christians who will not work on the Sabbath/Sunday including admitting guests. The influence traveling route 66 made me more observant of the old routes prior to the interstates. I realized Route 41 threading through Lake Shore Drive/Lincoln Ave/Old Skokie Road/Route 41 is our very local route 66-type route. It is no mistake those vintage motels, old gas stations and eateries along that corridor catered to people traveling through. Once you know what to look for then you recognize them all over the country. Route 66 goes right through my dad's home town, Litchfield, Illinois, and it would warm my heart if you stopped at the Ariston Cafe in Litchfield, in honor of my dad, who graduated from Litchfield High School a couple of years before the current proprietor, Nick Adams Jr. Aside from my selfish personal motive, the Ariston really is the best restaurant around. I am at the Ariston at some point at least once a year, but I particularly remember a time about five years ago, not long before Dad passed away, accompanying him at his class reunion. I asked Nick's wife if there was any place in town to buy the New York Times on Sunday. She rolled her eyes; said her big-city-living son was always asking the same question, and the answer was still no. And don't even think about asking about a Starbucks. "You don't know," she said, "how long it took me to get these farmers to eat baked potatoes!" Mashed, I presume, having been their deeply seated preference. Last edited by Katie on January 1st, 2011, 2:19 pm, edited 1 time in total. I'll second the motion for The Ariston in Litchfield. It is an occasional stop for us whenever we're traveling to or from Kansas City. The food is good, not great, but the total experience is a Route 66 "must do". Forgive the cliche, but, walking in The Ariston's front door is like stepping back in time to the 1930s. I know the Cozy Dog in Springfield brings mixed response here, but if you're looking for Route 66 classics you need to stop there. 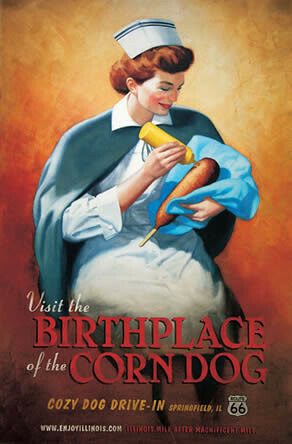 The actual hot dogs in the corn dogs are crappy little Oscar Meyers but the batter is an original and quite good. Yeah I know Gus' corn dogs at Wiener and Still Champion are better, but he's not located on Route 66 in Springfield now is he? Also in Springfield, although not on 66, is a guy with a BBQ trailer who sells some of the finest 'Que I have personally ever tasted. I met him through Roadfood.com and you can contact him through that site; just look up his screen name, "Dr. of BBQ" and send him a PM. We visited him last Christmas on our way to KC and enjoyed the food so much we stopped back on our way home and picked up enough brisket, pulled pork, ribs and BBQ beans to feed our entire New Year's Day party of 12 people with plenty of leftovers to boot. I know he has changed his location (it's literally a trailer with drive up service only), so if you're interested, contact him through Roadfood and find out where he has moved to. Finally, I gotta send you to Ted Drewes in St. Louis for frozen custard. Ted's is another Route 66 landmark that cannot be missed. As for the quality of the custard, let me put it this way: I'm a big fan of both Kopp's and Leon's in Milwaukee. But if gasoline were $.25 a gallon again and I had twelve hours available for the round trip, I'd skip the trip north and drive to St. Louis just for Ted Drewes! Yup, it's that good. We made the 66 trip from Chicago to just beyond St. Louis about 16 years ago. It is a grand trip that requires you to slow down and pay attention to the details. Cozy Dog Drive In, Springfield, IL, home of the "Dippin' Dog", aka corn dog. I feel like the fact that this place 1) is franchised and 2) has a website rules it out, but one of my favorite places from the part of Route 66 all the way out in Upland, CA is The Hat Pastrami (http://www.thehat.com/locaupl.htm). It has a big beautiful tissue paper thin pastrami sandwich in a classic stop-on-the-side-of-the-road setting. I also heard rumor that the first Marie Calendar's is located somewhere on Route 66 in the California area. Buddy, I'm with you. The Ariston is good food, not great, which is not at all in conflict with my statement that it's the best food around. Someday, I'm sad to say, the Ariston will be gone, all the Route 66 places will be gone, and we'll have lost something forever. Not just something about old cars and old roads. Something I can feel but can't quite put my finger on. Im not sure if it is exaclty on Route 66, in fact im sure its not...but in Albequerque the Frontier Restaurant and its sibling The Golden Pride are cant miss kitsch in my humble opinion. My wife's family is one of the original founding families of ABQ (some crazy relative walked there from pennsylvania and married an indian princess along the way yada yada yada ) and most of her family still lives up that way. When we go for thanksgiving every year this is the one place, other then the shed in santa fe, that the whole family hits togther for breakfast/brunch/lunch. The place is always packed with UNM students and families or drunks depending on what time of day you are there. They make the tortillas in house and the same goes for the chile. The sweet rolls and New Mexico classics are all great. My wife's family swears by enchiladas new mexico style, served flat with a fried egg on top covered in christmas (red and green chile). Last edited by iblock9 on July 19th, 2007, 4:08 pm, edited 1 time in total. iblock9 wrote: Im not sure if it is exaclty on Route 66, in fact im sure its not...but in Albequerque the Frontier Restaurant and its sibling The Golden Prude are cant miss kitsch in my humble opinion. The food in truly outstanding and the prices cannot be beat. And the atmosphere (six dining rooms in six storefronts) is truly unique. apparently you can UPS their goodies overnight. My wife and I might be in trouble. The Frontier is on old 66. Central Avenue was the route of US 66 when I was a child in New Mexico in the 1950s. Try the carne asada dinner. Certainly not a "can't-miss" but the building that once housed the first Dairy Queen still stands on the old Route 66 in Joliet. Rene G wrote: Certainly not a "can't-miss" but the building that once housed the first Dairy Queen still stands on the old Route 66 in Joliet. DQ #1 has been designated a landmark! On 31 Dec 2010 Caryn Rousseau (Associated Press) in the Chicago Tribune wrote: Joliet, a working-class city best known for the Stateville prison, a munitions plant, oil refinery and the Blues Brothers, has a lesser-known but sweeter claim to fame as the home of the first Dairy Queen. It's a proud fact that Joliet city leaders recently marked by giving historic landmark status to the more than century-old building where Sherb Noble started the soft-serve ice cream monolith. My husband and I did a two-week trip on Route 66 five years ago for our honeymoon. We couldn't have asked for a better trip. Cozy Dog in Springfield, IL is great. We actually took a trip back down to Springfield over Fourth of July weekend this last year, more or less as an excuse to get Cozy Dogs again (with Route 66 Root Beer of course). We also loved the over-the-top kitsch of Big Texan in Amarillo, TX. 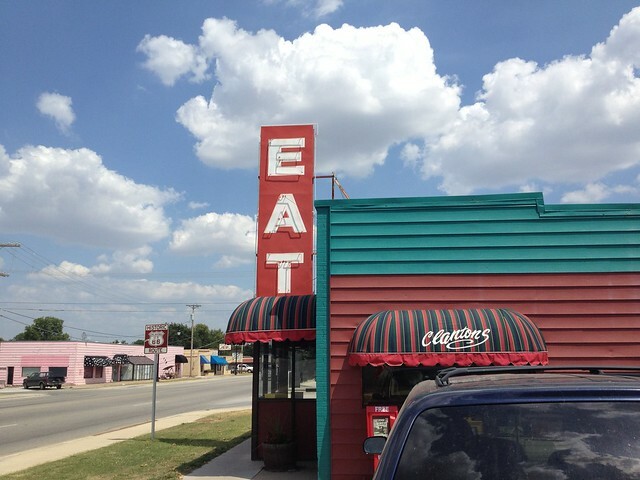 The food was good, in outsized Texan portions and the decor was fabulous. They have a shooting gallery arcade in the bar which is a fun hour or two passed if you're staying there. The adjoining hotel rooms are all Wild West themed, and it's just an overall fun experience. Another dining highlight was the La Placita Dining Rooms in the Old Town Plaza section of Albuquerque, NM. If I remember correctly, I got a fajita platter with really good pico de gallo, but the real stand out was the sopaipillas. They were intensely good - I can taste them in my mind's eye five years later! If you're heading southwest out of Chicago on the old Route 66 (or I-55) Lincoln would make a nice stop. It's about 170 miles away by I-55. Stretch your legs, take a gander at the watermelon statue, admire the pretty town square and have a schnitzel at Hallie's. Before we get to Hallie's, here are a few of the big sights of Route 66 you'll pass between Chicago and Springfield. Barely out of Chicago is the giant hot dog at Henry's in Cicero. Continuing on, a little past Dell Rhea's Chicken Basket, you'll find this giant chicken at Montana Charlie's. Just down the road in Romeoville there's another giant chicken at White Fence Farm. I assume those are the retired chicken fryers being used as planters. 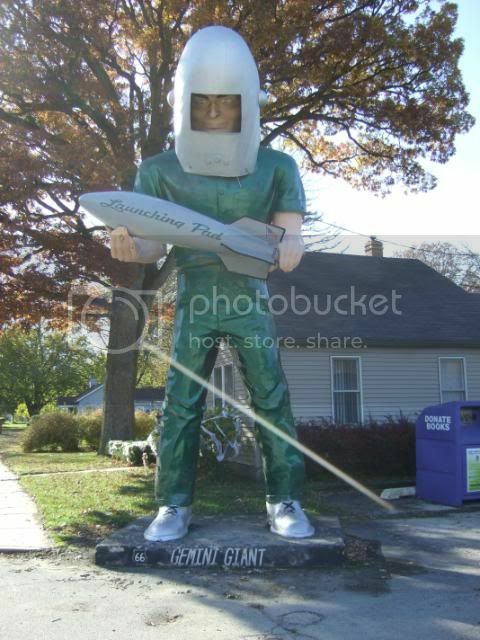 Taking Route 66 through Wilmington it's hard to miss the Gemini Giant standing outside the Launching Pad Drive In, recently put up for sale. No monumental signage in Dwight as far as I could see but it's a pretty little town. Frank Lloyd Wright's First National Bank of Dwight is certainly worth a detour. I wish it had been open so I could have seen the interior. In Springfield they like their guns and they like 'em big. This giant M16 is directly across from the Doctor of BBQ (closed when I was there) and not far from Cozy Dog. Backtracking about 40 miles northeast of Springfield you'll find the town of Lincoln and its bronze watermelon statue. On the southern edge of town, just off the old Route 66 is The Mill, an old tavern famous for schnitzel for many decades. The Mill fell into disrepair and finally closed in the 1990s but restoration efforts are underway. A descendant of The Mill's longtime owners has opened Hallie's in downtown Lincoln, on the well-preserved town square directly across from the Logan County Courthouse. Hallie's serves schnitzels prepared according to the old recipe. I was very pleased with this slab of fried pork. If it wasn't freshly pounded, breaded and fried it sure had me fooled. Its sensible dimensions and well-seasoned crust are exemplary. I especially appreciated Hallie's house-made schnitzel sauce—a thin red juice not unlike a spicy "Russian" dressing. Home of the Schnitzel, yes. Do you have a picture of the most excellent chicken salad sandwich I had at Hallie's? It was a close cousin to the chicken salad sandwich granted a second prize at Greater Midwest Foodways Alliance's Heirloom recipe contest. There is one more sight at Dwight, which I will put together soon. Cathy2 wrote: Do you have a picture of the most excellent chicken salad sandwich I had at Hallie's? Unfortunately I don't have one worth showing. Glancing at my photos of the sandwich (it looks like some bread on a plate) I'm reminded that the slice of tomato was what one would hope to be served in the middle of August but almost never get. Hallie's is a good spot. On the southern edge of Dwight, Illinois is Berkot's grocery store. Last August, stopped by in search of beer, locally produced potato chips and a tomato. Early on passed one farm stand, then foulishy drove past believing there would be more and it never happened. Dwight has a population of less than 4400 people. 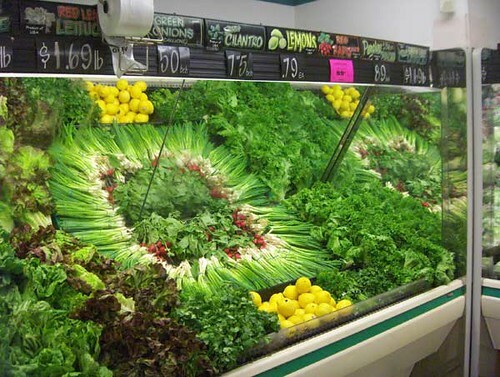 Amongst their population, they have a produce stocker who has the spirit of an artist. 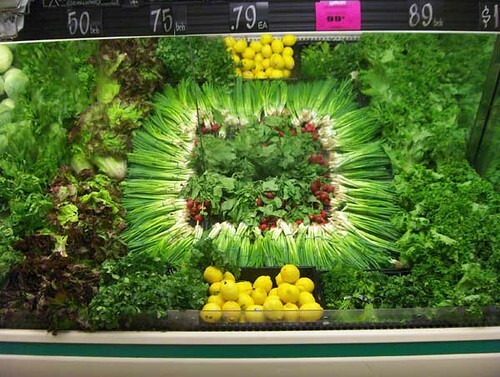 This produce stocker took full advantage of the mirror reflecting the produce below in their design. Felt a little bad taking a bunch green onions, because it would alter the carefully arranged vision. If this stocker were obsessive compulsive, there could be frequent moments of joy and pain as the design was admired, disrupted and rebuilt over and over again. While the salad vegetables are the masterpiece, other vegetables and fruit were arranged lovingly, too. This talented stocker has to be resolute their good design is fleeting. 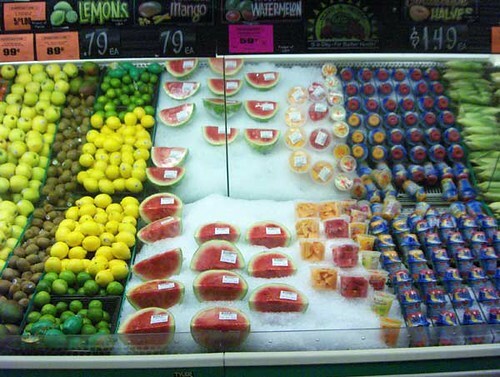 For every melon taken home, there are new opportunities to create new arrangements. 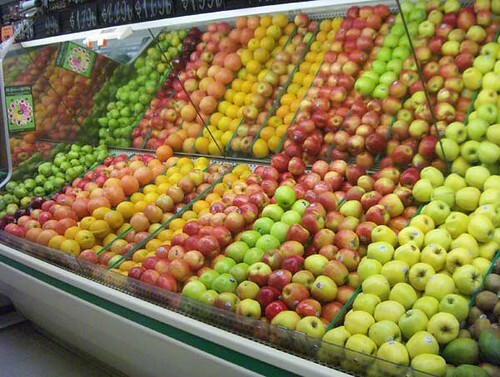 Never saw such well designed produce display outside of a trade show. 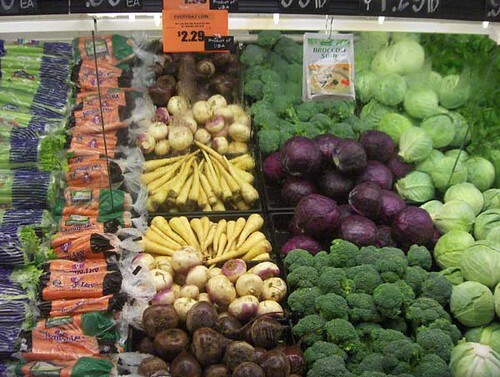 While many grocery store produce sections rely on halogen lights to brighten their produce. No lighting tricks are needed when you have a great designer in your midst. Berkot's is a small chain of grocery stores with twelve locations in Braidwood, Coal City, Dwight, Manhattan, Manteno, Mokena, Momence, New Lenox, Peotone, South Wilmington, Watseka and Wilmington. I can only attest to the great design at Berkot's in Dwight. I hope this artist is still there and knows someone really appreciates their efforts. If you're doing the CA-AZ segment make sure you follow the old alignment and go through Oatman, AZ. Drive is harrowing (road gets very narrow), but well worth it to see the wild burros and tacky frontier shops. In Seligman, AZ, check out the Snow Cap, it's a 66 essential. Rene G wrote: Home of the Schnitzel, yes. Speaking of tenderloins and or schnitzel's (what exactly is the difference?) stopped in at Hallie's in Lincoln, IL on the way back from the state fair. Whoa momma! 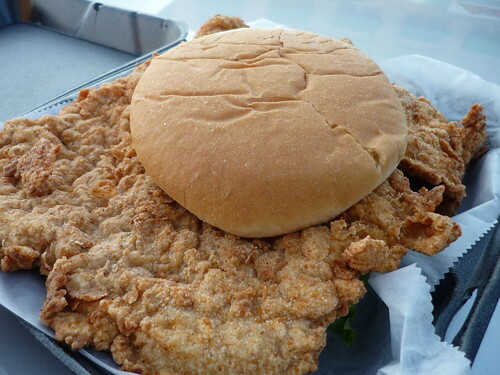 Now I'm no Tyrgyzistan when it comes to tenderloins but damn that's the best whole slab of fried pork, which to me is a tenderloin, I've ever had (I'll post about the best schnitzel I ever ate from Sheboygan soon). But then again I've only had two while in Iowa and those beer battered ones from over there look like they could be my first ex wife. Hallie's schnitzel wasn't really edible as a sandwich but a perfectly fried butterflied 'loin with the batter having a really nice spice kick. I liked each bite dipped with the slightest bit of their sauce which tasted like ketchup kicked up with fresh ground pepper. Also the old Tropics Coffehouse in Lincoln is still for sale, old school neon sign included. Da Beef wrote: Speaking of tenderloins and or schnitzel's (what exactly is the difference?) stopped in at Hallie's in Lincoln, IL on the way back from the state fair. Whoa momma! Happy to hear you enjoyed Hallie's schnitzel, definitely among my favorites. I'm not sure there's a clear distinction between a schnitzel and breaded pork tenderloin except the former often refers to veal and the latter to a sandwich (even though it's often not made with true tenderloin). As far as I know the terms are more or less interchangeable. I was at Hallie's a few months ago and decided to try the horseshoe. I'm pretty much 0-for-3 with this creation but figured if anyone would do a good job it would be them. What a waste of a good schnitzel! Awful cheese sauce and not-so-great fries (Hallie's onion rings are top notch though) ruined what would have been a very good meal. I think I may have it in me to try one more horseshoe (this one is a definite candidate) before possibly retiring from the game. If you like diners and diner food, you might consider Earl's in Gallup NM. It has been a few years since my visit, but as I recall, the service was friendly, the food was tasty, and served quickly considering that the restaurant was completely full and bustling during our visit. The menu was a combination of classic diner food as well as southwestern menu items. I used our visit as my opportunity to try Navajo tacos (essentially, fry bread tacos). I still recall that the fry bread was crispy outside and pillow-y soft inside. I left so stuffed that we had to walk around and sight see for a while before resuming out journey. One novelty is that Earl's allows local folks to set up in the parking lot and stroll from table to table to sell their wares (lots of jewelry, artwork and crafts). Our visit happened to be on a Sunday, so I don't know if this is an everyday occurrence. The vendors are respectful and not pushy, but I bought a beaded pen from a sweet boy of about age 8 when he locked his big eyes on me and told me "I made it myself". Knew I had seen this cool Route 66 roadside item in Wilmington, IL. on LTH, restaurant is closed & still up for sale..
Is there a significance to the giant chicken statues? I have seen several of these and they are all about the same size, but with tiny differences like a little top hat on the chicken or something. I always assumed it was a distributor/supplier giving these as gifts to customers, but I couldn't find anything online. My family had a fun and amazing trip on the front half of the Mother Road a couple of years ago from Chicago to Amarillo. Here is a link to my old trip report on the Roadfood website. I'm wearing my Clanton's T-shirt today at work! A couple of pics from my visit there in July. 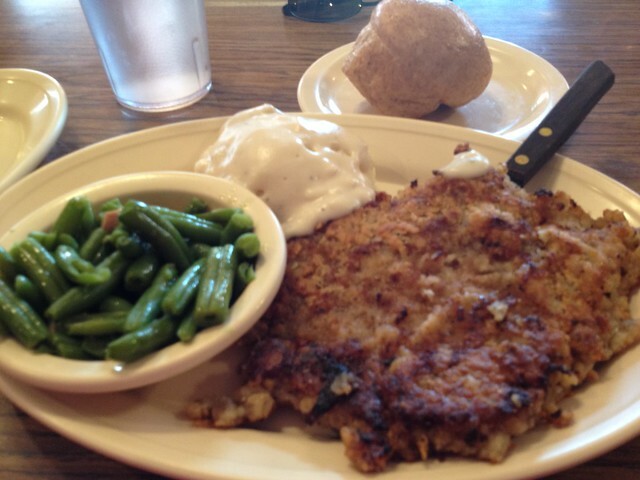 It's a great Chicken Fried Steak (I had gotten the gravy on the side at Clanton's so it's off camera), though I did not care for the green beans side. I'd consider going back, but the Chicken Fried Steak at Nelson's Ranch House in Tulsa is great too so I'd have to make a decision or spend the night in Tulsa so I can get both. Though it's not the one you ate, this one was similar, and indeed most excellent. A chicken salad sandwich (a bargain at $2.95), perhaps with a bowl of good soup, would be an excellent alternative to a schnitzel. But it would be a shame to visit the "Home of the Schnitzel" without having one. Restoration is proceeding on The Mill (the original Home), an old Route 66 landmark in Lincoln. I understand it will be a museum, not a home for schnitzels. Hallie's—and Lincoln itself; don't forget the watermelon statue!—is an excellent midway stop when driving between Chicago and St Louis.